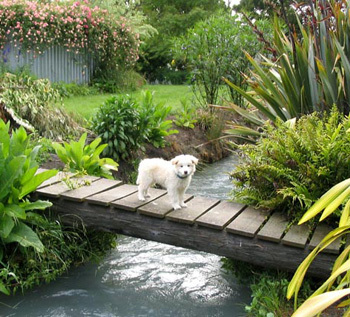 Even if my garden bridges tend to be functional, rather than decorative, I still think they're beautiful! I'm lucky to have a straight stretch of water running right through my garden. Several wooden footbridges span this water race, and they're absolutely essential in order to cross over the water. Cats may enjoy leaping across, dogs may delight in getting their feet and tummies wet, but older-lady gardeners certainly don't! The Water Race is a man-made irrigation canal, flowing right through the Moosey property behind the house. It's like a small burbling stream, but it's dead straight, with smooth river stones on the bottom. The water is used for irrigation and stock. Willow Bridge is a new Moosey bridge, spanning the water race near the willow tree stump. It's a wooden construction, strong and simple - not exactly what I'd ordered, but I love it. Finally Car Bridge has been rebuilt properly. Men and machinery have been busy working for three days, in the depths of winter, laying concrete pipes and filling in the bridge top with compacted gravel. One of the bridges spanning the narrow water race is called 'The Plank'. That's exactly what it is - a plank of wood (originally two pieces on top of each other). It's basic, wobbly, and a real trap for the unwary visitor. As its name suggests, Middle Bridge crosses the water race close to the middle of the property. It must have been walked over and wheeled over a million times since first constructed. The car bridge takes the driveway over the water race down to the hay barn, the Hazelnut Orchard, and the back paddock where the sheep graze. This is the original bridge, which started sinking noticeably at one end. Eventually it had to be rebuilt.